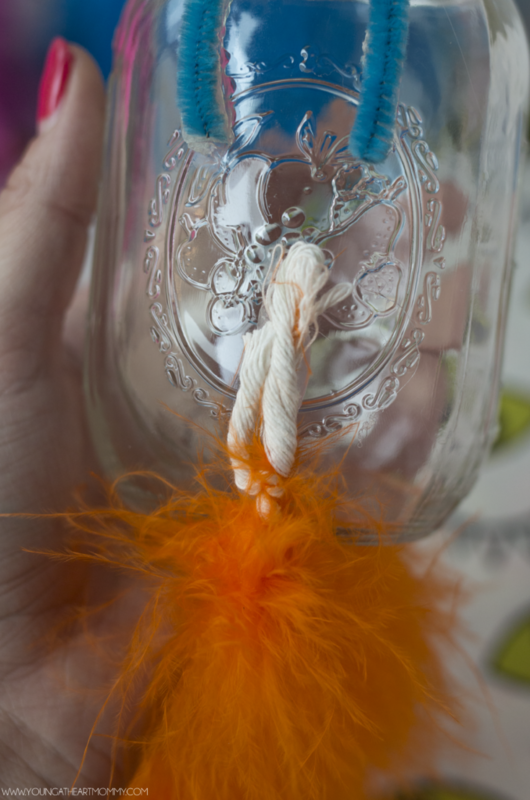 These furry monster mason jars can be filled with candy and used to decorate your space this Halloween. 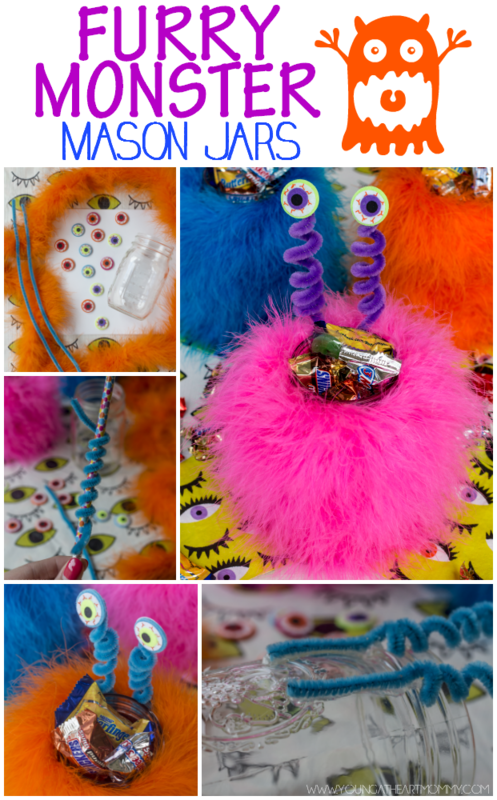 Crafting these fun little fuzzballs is much easier than you think and the kids will LOVE them! Finally, October is here and the Monster Mash is near! Halloween is only one day out of the year and we’re determined to make the most of it. 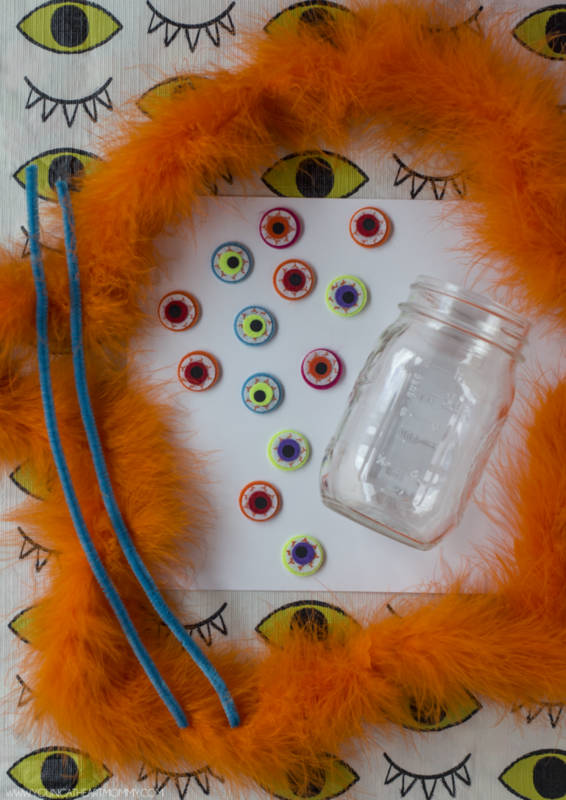 Here’s a fun and budget-friendly project you can do with your kids to get ready for spookiest day of the season. 1. 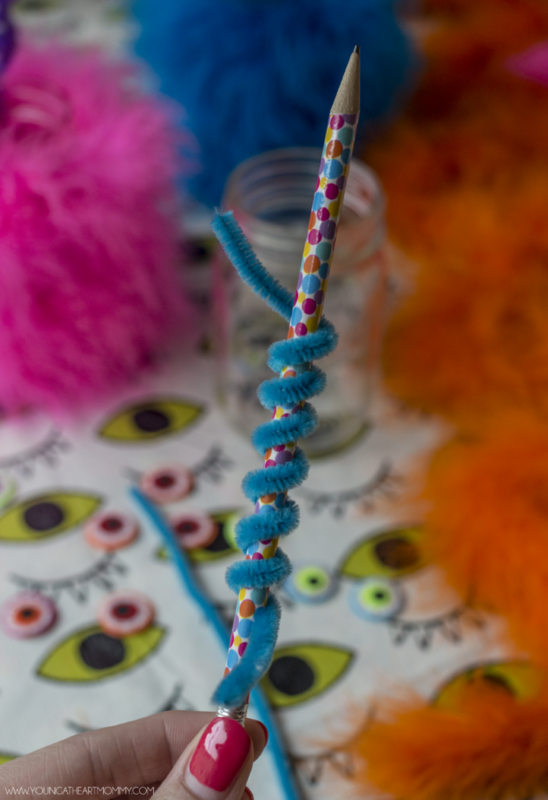 Wrap each individual pipe cleaner around a pencil, leaving about 1 inch of of slack on each end. This will create a spiral curl which will act as the tentacles that hold your monster’s eyeballs! 2. 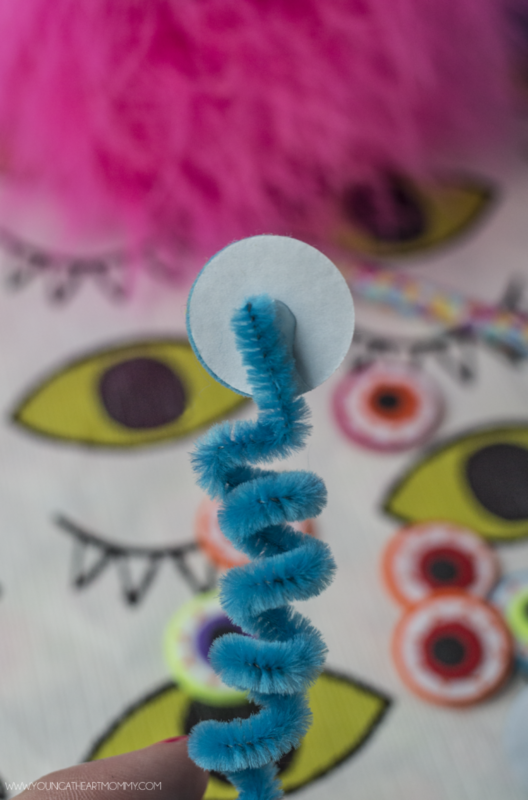 Use a dab of hot glue to attach the eyeballs to one end of the pipe cleaner. 3. 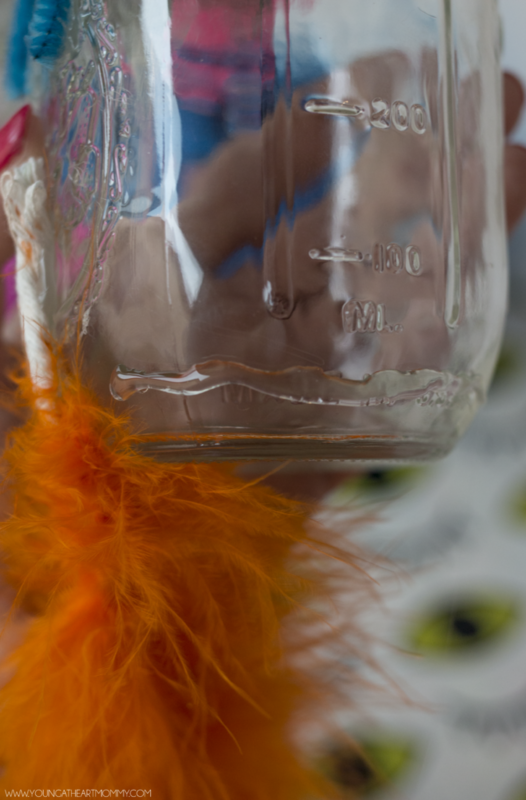 Apply two lines of hot glue vertically on the outside of the mason jar. Leave an inch in between each. 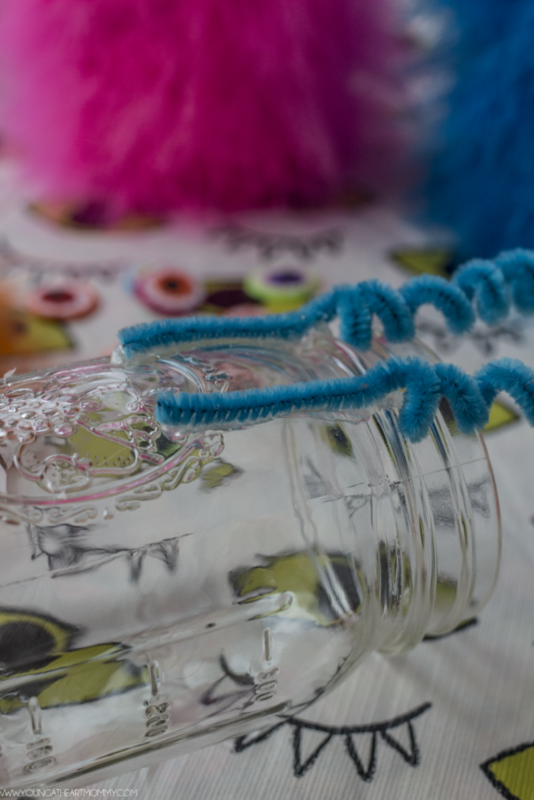 Attach the free ends of the pipe cleaner antennas, making sure the eyeballs are facing towards the opposite side you are working on. 4. The end of the boa should have a fairly thick piece of looped string attached to it. Use the hot glue gun to adhere it towards the bottom of the glass, in between the two ends of the antennas. If yours does not have a string, you can still glue the first inch of the boa’s end in the same location. 5. 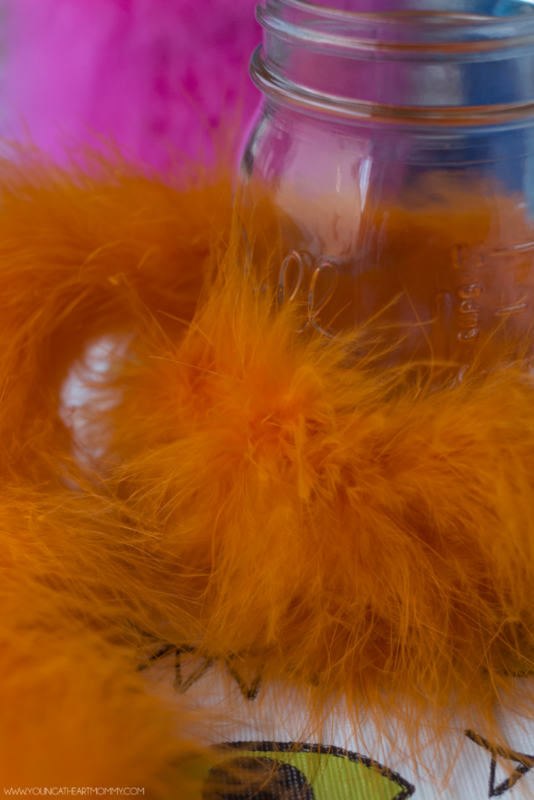 Apply another thin line of hot glue around the bottom part of the glass and begin to wrap the boa around. 6. Continue covering the entire mason jar until you reach the top, tightening each layer as you go. If it’s too loose, you may have gaps or openings in which you will be able to see the glass underneath it. Clip the end of the boa where it lies in the back, in between the two antennas. Use a little bit of glue to close it off and tuck any excess inside of the wrapped layers. 7. Fill with wrapped candy or cute Halloween pencils! 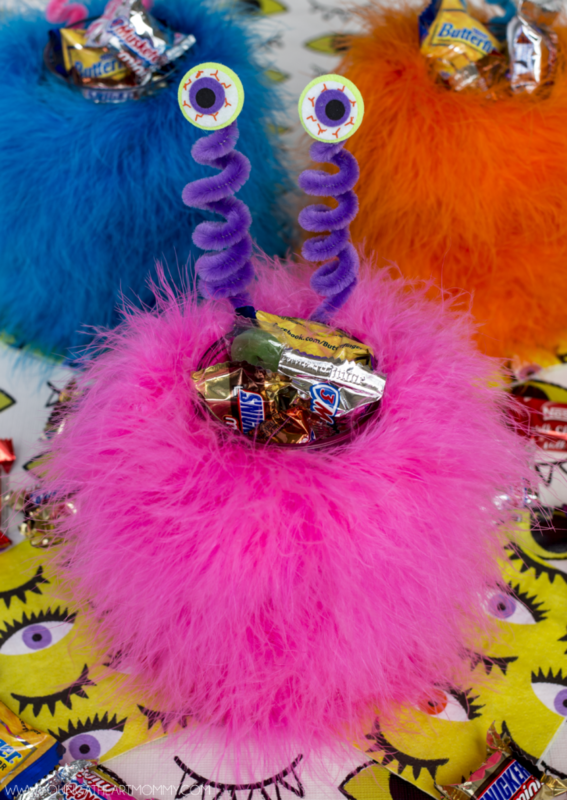 Not only will these little monsters put a smile on your kiddo’s face, they’re also great for teacher gifts. Halloween does fall on a Monday this year! Besides, who doesn’t have a few mason jars lying around? I’m practically swimming them. Love monsters as much as I do? 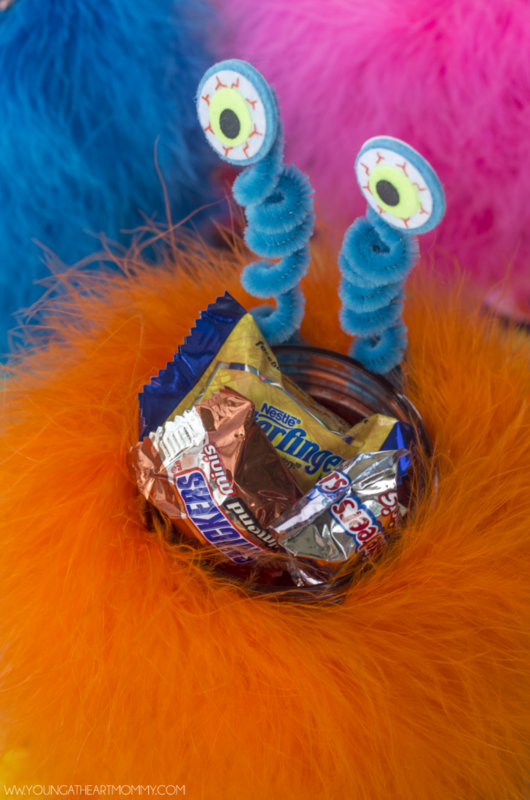 Check out this Furry Monster Candy Bowl tutorial from last Halloween. Trick-or-treating is serious business so you might as well make it fun for the little goblins and ghouls knocking on your door this year! 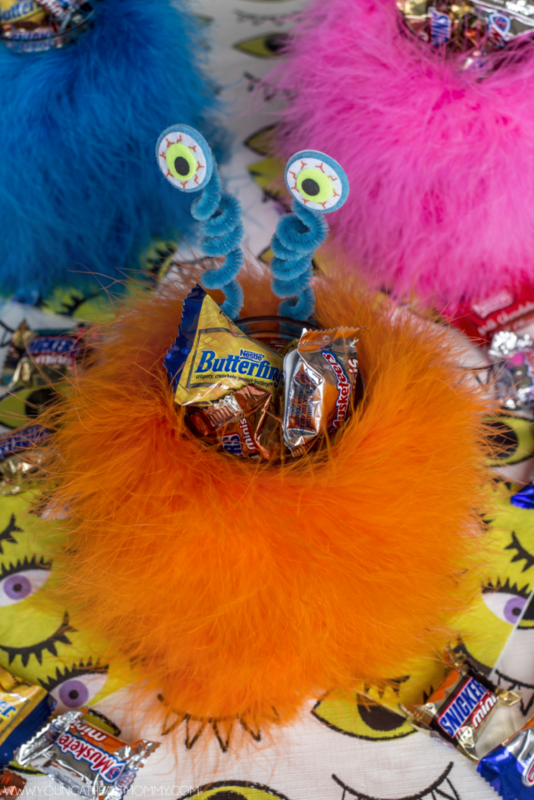 Have any fun monster-themed crafts or recipes to share? Leave me a link below! I would love to see your creepy creature creations.